I love roasted vegetables! Especially in the winter months. They are the perfect side dish this time of the year – warm and filling. 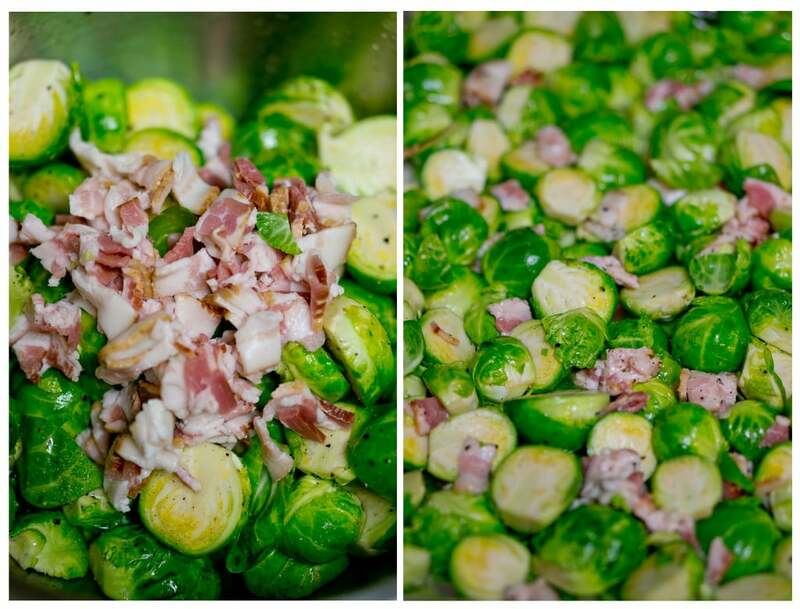 These roasted Brussels Sprouts and Bacon is so delicious and easy to make! Enter brussels sprouts and garlic. This side dish is full of flavor and nutrition. Add bacon to the mix and you have a match made in heaven. Brussels sprouts are tiny packages full of nutrition, high in anti-oxidants, potassium, calcium, iron, vitamin C, folate and they are an excellent source of dietary fiber. 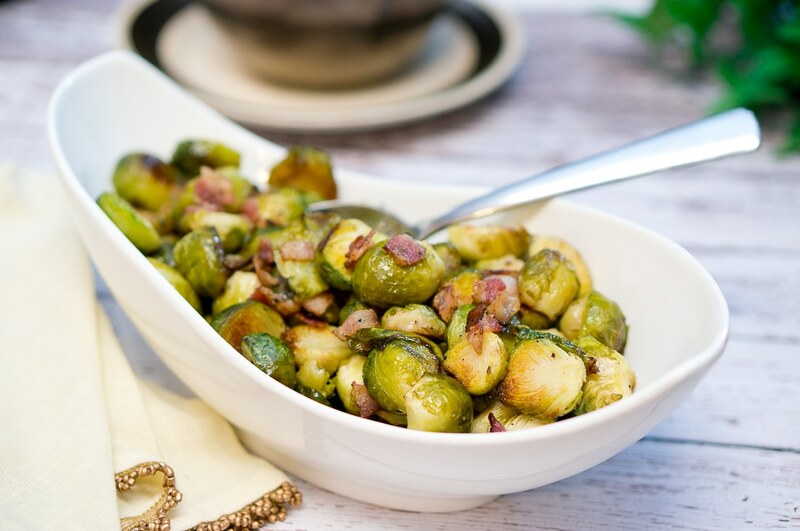 You can easily vary the recipe by sprinkling the brussels sprouts with lemon juice, balsamic vinegar or apple cider vinegar. They also taste delicious with pine nuts, which you can sprinkle on top when serving. You can similarly prepare roasted broccoli with bacon. Wash brussel sprouts, trim ends and cut in half. 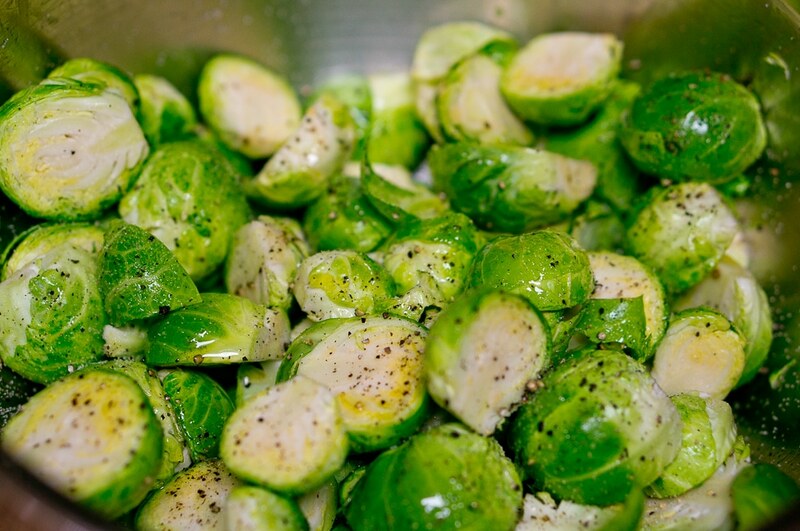 Place brussels sprouts in a mixing bowl and add minced garlic, olive oil, and season with salt and black pepper. Add diced bacon and toss to coat. Spread brussels sprouts on a foil-lined baking sheet. Pop it in the preheated oven and bake at 400 F for about 30 minutes, turning halfway through. These babies (don’t the look like baby cabbages) get roasted to absolute crisp-tender perfection, and you can serve them with pine nuts or sprinkle with lemon juice. They will get gobbled up in no time. 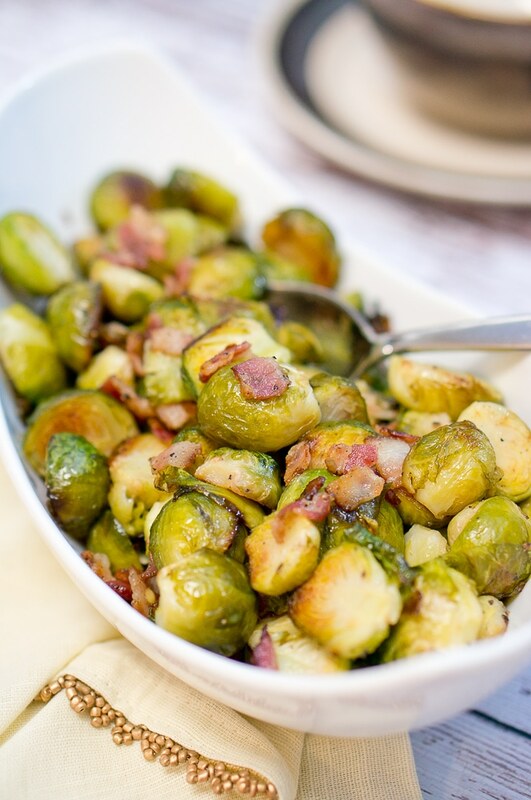 The best roasted brussels sprouts ever, made with garlic and crisp bacon goodness! Easy and delicious to make! Perfect side dish for the holiday table. Wash Brussels sprouts, trim ends and cut in half. Spread Brussels sprouts on a foil lined baking sheet. Pop the baking sheet in the oven and bake in a preheated oven at 400 F for about 30 minutes, turning halfway through. 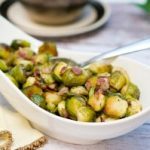 I love brussels sprouts and this version sounds and looks delicious! Will be trying it soon! Pinned! I have made something similiar to this and it was great. I will be trying this in the next week or two. However, I don’t use salt, but I will use Mrs. Dash’s Garlic and Herb for seasoning and that will replace the salt and garlic. Thank you for a great receipe.